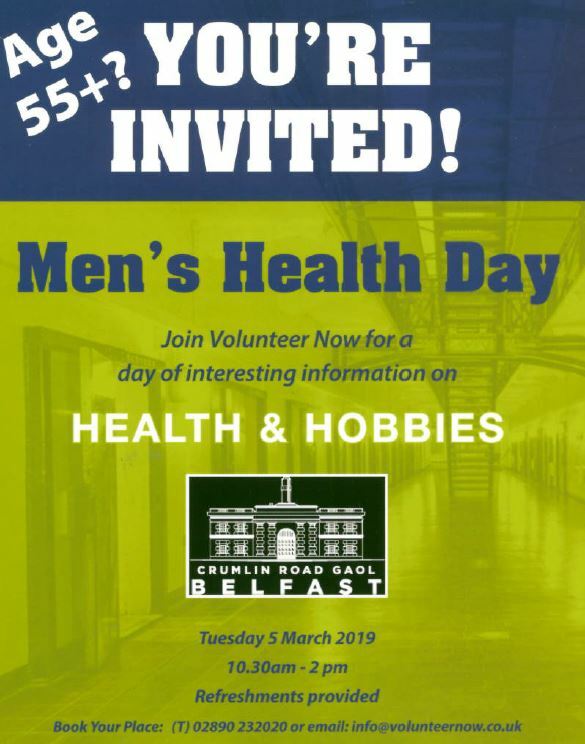 We will be holding a Men’s Health Event at Crumlin Road Gaol on Tuesday 5th March from 10.30-2.00pm. It will be an action-packed morning with information stands, entertainment and activities (see list below). There will also be an opportunity to have a tour of the jail and refreshments will be provided. If you know of any older men aged 55+ please invite them to come along, they need to register to attend by contacting Volunteer Now reception on 028 90232020. Entertainment including cycling, fitness fun, health therapies, massage, barber, interactive quiz, tour of the gaol AND much more! !